Soon you might be able to hide someone from your Twitter feed without them knowing. Twitter is testing out a “mute” function that would allow you to block someone's tweets from appearing in your feed, but without officially blocking or unfollowing them, reports The Verge. 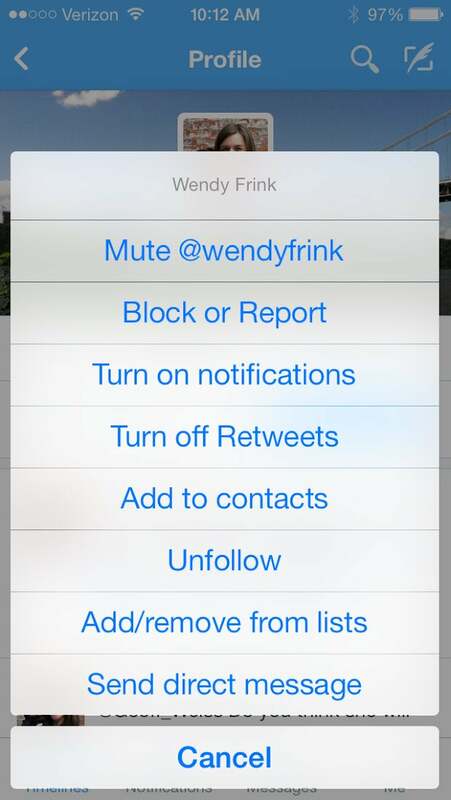 When you mute someone, you’ll still be able to see what they are up to if you go directly to their profile. The Twitter user will not know they have been muted, and the mute is permanent unless you decide to unmute the individual. Right now, the function is only available for select users and only on the mobile app. As you can imagine, having a mute capability is useful if a brand or person is live-tweeting an event you have no interest in, having a meltdown (although that can be fun) or participating in a Twitter chat. The feature is along the lines of Facebook's “unfollow” option, which allows you to still be someone’s friend without seeing their updates. Some third party apps like Tweetdeck allow you to mute a user, but that function is only available on that specific app. So you will still see that muted person if you use the Twitter app or twitter.com. An email to Twitter was not immediately returned.